Citation: Wang ML, Xin Z, Burow G, Chen J, Vankus P, et al. Evaluation of sweet sorghum accessions for seedling cold tolerance using both lab and field cold germination test. J Agric Sci Bot 2017;1(1):1-8. Objective: Seedling cold tolerance is one of the important traits for sweet sorghum production. This study is to evaluate the method for identification of sweet sorghum accessions with seedling cold tolerance using both lab cold germination and field early-spring cold planting. Methodology: Sorghum seeds were germinated in growth chamber (under lab cold condition) at a constant 12°C for five weeks. After two weeks, germinated seeds and germination rates were counted and calculated at weekly intervals for four times. The same seed lots for lab cold test were also planted 45 days earlier than the normal planting time in the field (early-spring cold planting). In addition to seedling dry weight, germinated seeds and seed germination rates were also counted and calculated at weekly intervals for three times. Results: In this study, a high correlation coefficient between lab germination rate and field germination rate (R2=0.503, p<0.0001) was observed. In general, lab germination rate can predict the field germination performance; but some discrepancies between field and lab tests were also observed for some accessions. Among 212 sweet sorghum accessions tested, several sweet sorghum accessions with seedling cold tolerance were identified from both lab and field tests. These accessions will be useful materials for development of sweet sorghum cultivars with early spring cold tolerance. Conclusion: Compared with the field test, the lab test is less labor intensive. For a large-scale screening of seedling cold tolerance, the lab test may be conducted initially followed by selection of superior accessions from the lab test for further evaluation under field conditions. Sweet sorghum germplasm, Seed germination rate, Seedling cold tolerance. Early planting (or early sowing) may increase yield of sugar, grain or biomass; but it depends on many factors (e.g. rainfall, soil types and temperatures, cultivars, and crops). For example, early planting soybean in southwestern Japan can increase grain yield . But planting peanut in early to mid-April instead of early to mid-May in the state of Georgia can increase the risk of tomato spotted wilt virus (TSWV) incidence  and lead to yield reduction. Sorghum seeds can be planted in early April for achieving a higher yield or earlier harvesting time for a double-cropping system in Texas, but selection of cultivars with early spring cold tolerance is important. Sorghum cultivars with early spring cold tolerance have several obvious advantages: faster and better seedling emergence and establishment, an extended growing season in the same region, and slightly expanded planting zones from the south to north regions . Significant seedling cold tolerance exists in sorghum. Several studies have been conducted on seedling cold tolerance in grain sorghum [3,4]. Three SSR markers for different QTL for early-season cold tolerance have been identified, and they are mapped in different chromosome regions [5-7]. However, little research has been conducted on cold tolerance in sweet sorghum. The U.S. sweet sorghum collection is maintained by the Plant Genetic Resources Conservation Unit (PGRCU) at Griffin, GA. These sweet sorghum accessions are used as experimental materials for screening seedling early-spring cold tolerance under both lab and field conditions. Therefore, the objectives of this study were to (i) determine the germination rates of sweet sorghum accessions under cold conditions in both lab and field; (ii) determine the correlation coefficients among investigated traits; (iii) determine the correlation coefficients of germination rates between lab and field conditions; and (iv) identify accessions with cold tolerance under both lab and field conditions and recommend them to sweet sorghum breeders as parental materials for developing new cultivars. Sweet sorghum accessions: Seed regeneration for sweet sorghum accessions was conducted every year from 2013 to 2015 at St. Croix, Puerto Rico. Fresh seeds, after breaking dormancy, were used for germination testing. Four checks (Rio, a good sweet sorghum cultivar; BTx623, a good grain sorghum cultivar; GT26056, a good early spring cold tolerance cultivar; and PI 610727, a very good early spring cold tolerant cultivar from Shanxi, China) were used for comparison with the sweet sorghum accessions. A total of 212 sweet sorghum accessions plus four checks used for both field and lab germination tests are listed in (Table 1). PI 152733 MERISSA (BARI) PI 247744 U. g. 6. 7. Table 1. Information on PI number and identifier for the selected sweet sorghum accessions. Detailed information about sweet sorghum accessions can be obtained from the USDA-ARS Germplasm Research Information Network (GRIN) website. Lab cold germination test: The growth chamber (Percival Scientific, Inc., model GR36L) was set at a constant 12°C and 60% humidity with eight hours of light and 16 hours of dark. Seeds were treated with thiram before testing. Fifty seeds were evenly spread out onto a double layer of wetted germination paper towels, wrapped up, and bound in place with a rubber band. The bound paper towels were then transferred standing upright into a lattice plastic tray (to allow air circulation around towels) and placed in the growth chamber. Whenever the paper towels needed to be rewetted, 12°C water was used from a carboy stored within the same growth chamber. High humidity (~60%) was maintained by keeping an open plastic basin containing clean tap water at the bottom of the growth chamber at all times. After two weeks, the wrapped paper towels were opened on a clean table to count germinated seeds, which were removed from the towels. Seeds not yet germinated were then wrapped up again and put back into the growth chamber for further germination. Following the same procedure, seeds were recounted at weekly intervals three more times. Germination rates for each accession were calculated cumulatively for each counting time. Field early-spring planting evaluation: Normal planting time for sorghum in Lubbock, TX is around May 15th, but the planting time for early-spring cold tolerance test in this study was April 1st (45 days earlier than the normal planting time). The same seed lots for the growth chamber test from 212 accessions were also used for the field planting evaluation. Twenty-five seeds were planted in a 6 x 1 meter row, and two replicates were planted for each accession. The seedling emergence was first counted fourteen days after planting. Seedling emergence was recounted at weekly intervals two more times. Similar to lab germination rates, the seed germination rates in the field were also calculated cumulatively. Seedling dry weight and emergence index: At 28 days after counting, the above-ground seedling tissues from five seedlings for each accession were cut, harvested, and then were dried in an oven at 80°C for 72 hours. After drying, the seedling tissues were weighed and the dry weight recorded (g/5 seedlings). Emergence index (EI), a measurement of rate of emergence, was calculated using the following formula: EI=Σ (Ej x Dj)/E where Ej=emergence on day j, Dj=days after planting, and E=final stand. The final stand counts were taken at 28 days and 35 days for field test and lab test, respectively . Statistical analysis: An analysis of variance was performed on the data and means were using minimum significant difference (MSD) comparison procedure (SAS, 2008, Online Doc® 9.2. Cary, NC: SAS Institute Inc.). Significant correlations between investigated traits were determined using Pearson correlation coefficients. Variation in germination rates from lab and field, emergence index, and dry weight of field seedlings: The germination rates from lab and field conditions counted at different times plus dry weight of five field seedlings are listed in (Table 2) and shown in (Figure 1). Overall, at the beginning the seeds germinated more slowly in the field (2.01% at 14 days) than the lab (18.71% at 14 days). After 21 days, the germination rate was higher in the field (35.69% at 21 days, 43.20% at 28 days) than in the lab (28.86% at 21 days, 36.92% at 28 days) (Table 2 and Figure 1). Some accessions (e.g. PI 610727, a very cold tolerant check in replicate 2) reached 100% germination in the field at 21 days; while in the lab 100% germination was reached by some accessions (e.g. PI 154800 in replicate 1) at 28 days. Sorghum seeds appear to germinate more quickly in the field than in the lab. This observation is supported by the emergence index (EI). The average emergence index was lower in the field test (19.45) than in the lab test (20.02). Temperature fluctuation (between day-time high and night-time low) may be required for a better germination. In addition to lab/field environmental conditions, differences in accessions (genotypes) also significantly affected the germination rate. 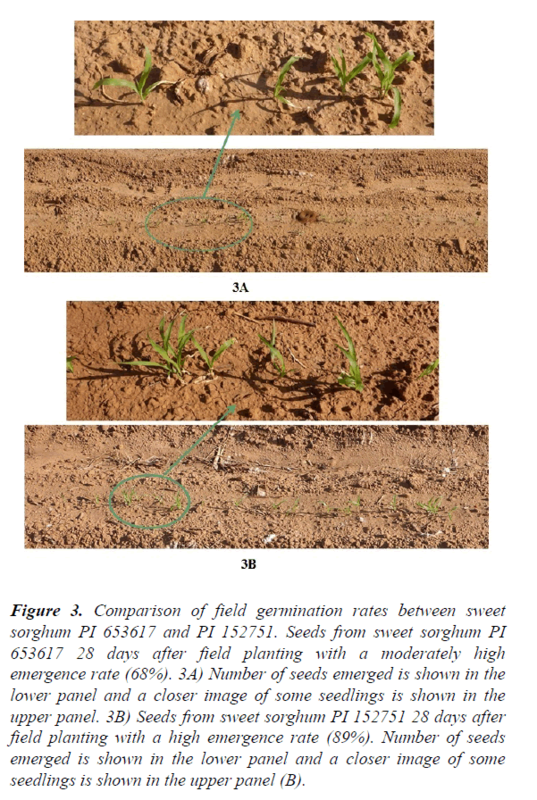 Significant differences in germination rates for both lab (0–100%) and field conditions (0–100%) were identified among sweet sorghum accessions. The results from this study are consistent with the results from a previous study in which different cultivars differed significantly between lab germination and field emergence9. 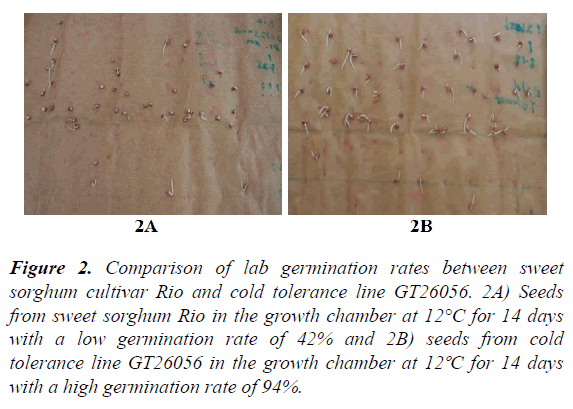 For example in the lab, the germination rate of the sweet sorghum cultivar Rio was only 42% at 14 days (Figure 2a), while the germination rate of GT26056 reached 94% at 14 days (Figure 2b). In the field, the germination rate of sweet sorghum accession PI 653617 at 28 days was only 68% (Figure 3a), while the rate of PI 152751 at 28 days reached 89% (Figure 3b). Table 2. Simple statistics for the lab germination rate, field germination rate, and seedling dry weight. (N=Number of samples; Std Dev=Standard Deviation). Figure 1. Comparison of germination rates between field and lab at different time-counting intervals. The x-axis indicates days after planting or growing in the field or growth chamber, the y-axis is the germination rate (%). Blue curve represents the lab experiment and red curve represents the field experiment. Figure 2. Comparison of lab germination rates between sweet sorghum cultivar Rio and cold tolerance line GT26056. 2A) Seeds from sweet sorghum Rio in the growth chamber at 12°C for 14 days with a low germination rate of 42% and 2B) seeds from cold tolerance line GT26056 in the growth chamber at 12ºC for 14 days with a high germination rate of 94%. Figure 3. Comparison of field germination rates between sweet sorghum PI 653617 and PI 152751. Seeds from sweet sorghum PI 653617 28 days after field planting with a moderately high emergence rate (68%). 3A) Number of seeds emerged is shown in the lower panel and a closer image of some seedlings is shown in the upper panel. 3B) Seeds from sweet sorghum PI 152751 28 days after field planting with a high emergence rate (89%). Number of seeds emerged is shown in the lower panel and a closer image of some seedlings is shown in the upper panel (B). In sweet sorghum growing regions where early spring cold may be an issue, accessions with good tolerance to early spring cold should be selected and used as parental materials to make crosses for developing new cultivars. The average dry weight of five seedlings in the field was 0.72 g, ranging from 0.23 to 1.74 g. PI 201723 (1.74 g/5 seedlings) had a significant higher (P<0.05) dry weight than PI 155516 (0.23 g/5 seedlings). Seedling dry weight may relate to early spring cold tolerance. This issue will be discussed in the following section of unique germplasm accessions identified. Correlation coefficients among investigated traits: The results of Pearson correlation coefficients, probability, and number of observations among lab germination rates, field germination rates, and seedling dry weight are listed in (Table 3). In the field test, all the correlation coefficients among different countings were significant (p<0.0001). But the correlation coefficient values between the first counting and the second and third countings were low (R2=0.287 and R2=0.266, respectively), while the correlation coefficient value between the second counting and the third counting was very high (R2=0.944). In the lab test, all correlation coefficients among the different countings were significant (p<0.0001), and all correlation coefficient values were also high (all R2>0.84). The germination conditions in the lab are very controlled compared to the field. This may partly explain why there was some inconsistency in the correlation coefficient values among the different countings in the field. A high correlation coefficient between lab germination rate and field germination rate (R2=0.503, p<0.0001) was also observed. The correlation coefficient of seedling dry weight with the field germination rate was much higher (R2=0.257, p<0.0001) than with the lab germination rate (R2=0.109, p<0.05). Table 3. Pearson correlation coefficients, probability, and number of observations for lab germination rate, field germination rate, and seedling dry weight. 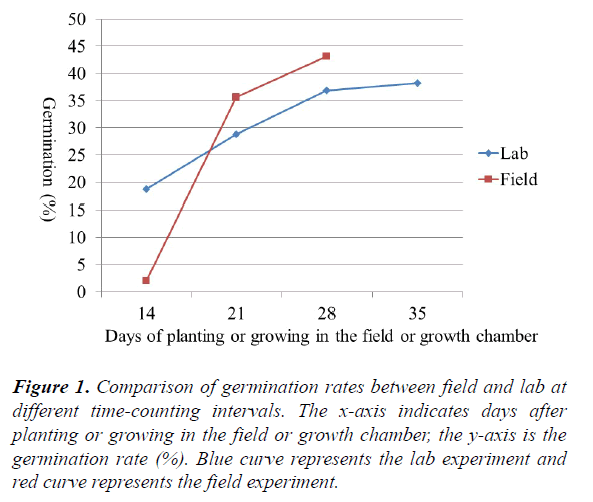 Consistency and discrepancy in germination rates between lab and field conditions: In general, the lab germination rate can reflect or predict the field germination rate. The results from this study were consistent with the results from an earlier report on sorghum hybrids. But some discrepancies between the field and lab tests were observed. For example, the lab germination rates (84%, 90%, 96%, and 94%) of four checks (Rio, BTx623, GT26056, and PI 610727) were consistent with their field germination rates (80%, 80%, 91%, and 94%), respectively (Table 4). Table 4. Difference in seed germination rates between field and lab from some selected accessions. Thus, the lab germination rates predict well the field germination rates for these four checks. We also observed that the germination rate for some accessions was high in the lab but low in the field. For example, the lab germination rate for PI 247745 was 91%, but its field germination rate was only 48%. The field conditions are more variable (e.g. lower nighttime temperature in the field) than the controlled lab conditions. Emergence of the seedlings from soil in the field can be adversely affected by soil type and level of moisture, whereas moistened germination papers in the lab offer no resistance to emergence. Some accessions may be cold tolerant to the lab conditions (12°C) but less tolerant to the field conditions where the temperature can dip much lower than 12°C. This may explain the difference in cold tolerance between the lab and field tests. Conversely, the lab germination rates for some accessions (PI 146890 and PI 653617) were low (25% and 35%) while their field germination rates were high (92% and 82%). These big differences between lab and field germination rates are difficult to interpret. One possible explanation could be that these accessions may require a lower temperature for breaking seed dormancy. Additionally, since fresh seeds were used, these accessions may have not completely overcome their seed dormancy yet before the start of the germination experiment. The lab experimental temperature of 12°C may not be low enough to break dormancy for some accessions, but the field low temperature can easily break its dormancy resulting in better germination rates. This explanation is supported by the second year lab germination test. After receiving the fresh sweet sorghum seeds from Puerto Rico, the seeds were stored at room temperature for less than two and half months before the beginning of the lab cold germination test. Overall the germination for most accessions from the second year was postponed by about two weeks. The postponed lab germination can only be explained by seed dormancy. To draw a final conclusion, the lab germination test for these accessions needs to be repeated. Unique germplasm accessions identified: Besides the four checks (Rio, BTx623, GT26056, and PI 610727) which had high germination rates under the field cold conditions, three other accessions (PI 146890, PI 653617, and PI 195754) were identified with high field germination rates of 92%, 82%, and 80%, respectively. These three accessions also had lower emergence indexes (EI) (18.29, 17.63, and 18.52 respectively) than the average EI (19.45). The lower the EI value is, the earlier the seeds germinate. This means that these three accessions not only had high germination rates but also had earlier emergence. Compared with other accessions, the seedlings from these three accessions could establish more robustly than other lines within the same time window. For seedling dry weight, PI 146890 and PI 653617 averaged 0.838 g and 0.826 g, respectively, which is similar to the average (0.72 g). PI 195754, however, was 1.363 g, significantly higher than the average. Seedling dry weight (obtained from the early spring planting) may be an important indicator for early spring cold tolerance. PI 195754 was originally curated in China (GRIN database). The Chinese sorghum germplasm collection is known to contain accessions with good tolerance to early spring cold temperature [9-11]. Early spring cold tolerance is an important and complex trait. When freshly harvested seeds are to be used for screening early spring cold tolerance, seed dormancy should be considered. If the tested seeds have not completely overcome dormancy, the seed germination time and rate can be significantly postponed and reduced. Significant variability in the early spring cold tolerance exists among sweet sorghum accessions. There are over 2,100 sweet sorghum accessions in the USDA germplasm collection. Although some accessions with good tolerance to early spring cold were identified, we only tested 212 accessions (10%). In order to fully characterize the sweet sorghum collection for early spring cold tolerance, all accessions need to be first tested under lab conditions. Then the superior accessions selected from the lab test will be further evaluated in the field. The best sweet sorghum accessions will be selected and recommended for use by sweet sorghum breeders. At the same time, based on the published information of cold tolerance genetics (such as genetic heredity, QTLs, and existing genetic markers) and multiple harvests, crosses will be made between accessions with contrasting cold tolerance to establish bi-parental mapping populations to map the cold tolerance traits to specific chromosome regions for eventually cloning and identifying genes for early spring cold tolerance. This study discovered the relationship between lab cold germination test and field seedling cold tolerance performance that can be beneficial for sweet sorghum breeders. This study will help sweet sorghum breeders to select parents from the unique accessions to make crosses for developing new cultivars in their breeding programs. The authors would like to thank Mr. Jerry Davis from the Department of Statistics, University of Georgia for his excellent assistance in statistical analysis. Matsuo N, Fukami K, Tsuchiya S. Effects of early planting and cultivars on the yield and agronomic traits of soybeans grown in southwestern, Japan. Plant Prod Sci. 2016;19:370-80. Hagan A, Weeks R. Tomato spotted wilt virus on peanuts. Alabama Cooperative Extension System, ANR. 1998;574:1-4. Yu M, Tuinstra MR. Genetic analysis of seedling growth under cold temperature stress in grain sorghum. Crop Sci. 2001;41:1438-43. Yu J, Tuinstra MR, Claassen MM, et al. Analysis of cold tolerance in sorghum under controlled environment conditions. Field Crops Res. 2004;85:21-30. Knoll J, Ejeta G. Marker-assisted selection for early-season cold tolerance in sorghum: QTL validation across populations and environments. Theor Appl Genet. 2008;116:541-53. Smith PG, Millet AH. Germinating and sprouting response of tomato at low temperature. J Am Soc Hortic Sci. 1964;84:480-84. Brar GS, Stewart BA. Germination under controlled temperature and field emergence of 13 sorghum cultivars. Crop Sci. 1994;34:1336-40.